Scenario 7 from Victory Games' Sixth Fleet is about a hypothetical war that brews up between Libya and the United States. After Gaddafi orders one of his subs to sink an American LSD filled with Marines headed to Beirut, Reagan orders airstrikes on Libya as punishment. This task falls to the US Sixth Fleet, specifically the USS Nimitz with its full complement of aircraft and carrier task force ships. Two American subs, the USS Drum and the Omaha (Sturgeon-class and Los Angeles-class respectively), are along for the ride. The US player gains 1 VP after hitting the bases in all three Libyan cities (Tripoli, Benghazi, and Darnah). Once they are all hit once, he must hit them all again to get 2 VP apiece for each city and he gets 3 VP for each city after hitting each them all three times. To win, the US player needs 9 VP. What must it have been like, standing on the bridge of an American aircraft carrier in the South Pacific in 1942 or 1943? Looking over the vast calm ocean straight to the horizon and knowing that somewhere out there, someone was trying to find you and kill you and the only thing that you could do to avoid that was to find them and kill them first. It must have been terrifying and strange and beautiful all at the same time. Victory Games' Carrier (1990) designed by Jon Southard, tries to capture this feeling for the player. 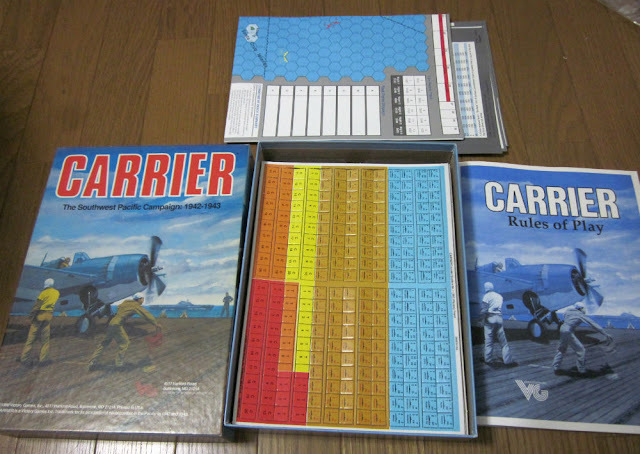 Continuing on with my learning of Carrier from Victory Games (1990), I have just tried scenario 3. This scenario is meant to teach movement of ships. In this game, Japanese task forces are given objectives that they are attempting to reach so the good news is that not everything out there is trying to sink your little carrier force. On the other hand, letting the bad guys drop off thousands of fresh troops on Guadalcanal will probably not help your victory point tally at the end of the day. Since becoming an avid solitaire gamer several years ago, one of the games I kept hearing about over and over again was Victory Games' Carrier (1990). The reviews I read online spoke about it with the kind of reverence you would normally reserve for saints or minor deities. It was one of those games that I always intended to buy but the high prices for this out-of-print Jon Southard design put it out of my reach for a long time. As the end of last year approached, curiosity got the better of me and I trotted out the necessary self-justifications and rationalizations for splurging on a copy for my birthday.